I must admit that this is one of my favorite churches - mostly because of an error on a Latin exam in seminary. Despite the fact that I am AGAIN studying Latin, back in seminary there's only one way I made it through Latin class: TEARS. I figured I could just know the root word and "figure it out." NO WAY! As my current Latin teacher, Fr. Glade, says regularly, "He who does not know his endings comes to a bad ending." How true! Well, on a Latin test at seminary I missed the word for "chain" - vinculum - I'll never forget it now. Year later I was wondering around Rome - and saw a sign: "San Pietro in Vincoli." Immediately recognizing the word "chain" I knew what it was - the Church of Peter in Chains - so I rushed along the cobblestone street to reach the church. Today, I returned to that church (after several attempts to find it after arriving here last March). It's not too far away from where I go to school, so I made the familiar trek up the Oppian Hill past the Angelicum and continued on to the church of St. Peter in Chains. 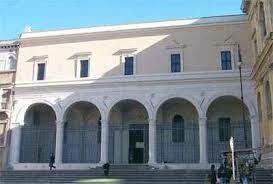 and there discovered, once again, the graceful Renaissance portico of the church. According to the more likely hypothesis on the archeological history of this church, the first place of Christian worship on this site dates from the late fourth or early fifth century, being completed by Pope Sixtus III. In 431, a priest from here named Philip was a papal legate to the Council of Ephesus, at which he identified himself as coming from the titulus Apostolorum. This likely refers to that early church’s dedication. Disaster would strike the first church shortly after this time in the form of either fire or earthquake, leading to its almost total destruction. Luckily, the Byzantine Emperor and his wife had pledged their support to the previous church, and continuing in this spirit their daughter Eudoxia helped to rebuild the church. The front and back walls of the original church had remained mostly intact, so this reconstruction consisted mainly of rebuilding the nave of the church. 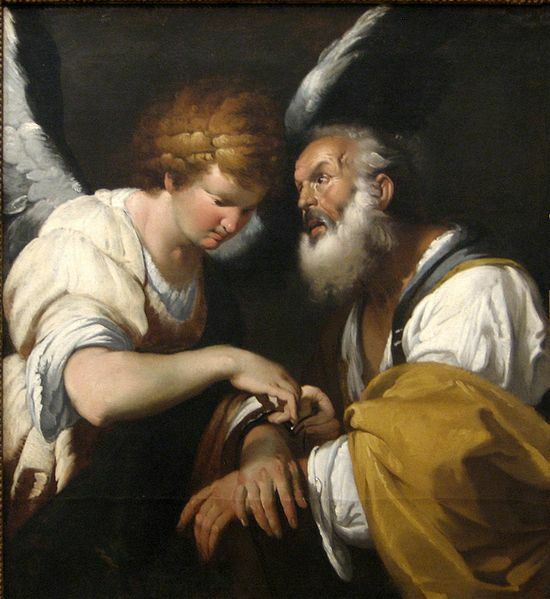 This was undertaken and the repairs were completed around the year 450, around the same time that the chains from St. Peter’s imprisonment in Jerusalem were given to the church; when these were placed with the chains from St. Peter’s imprisonment in Rome, the two fused together. In the year 519, the Byzantine Emperor Justinian wanted to bring the chains to Constantinople, but was rebuffed. Towards the end of that century, the church was rededicated at the same time that the relics of the Maccabee brothers were brought here. 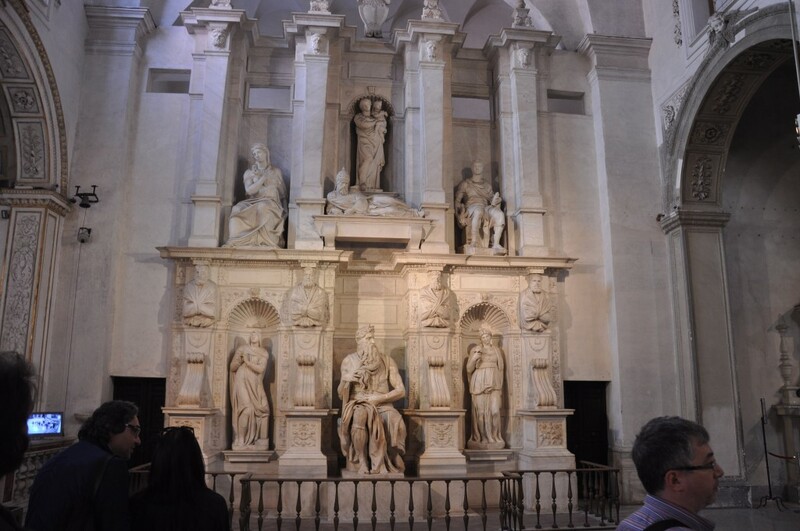 Two centuries later the church was restored by Pope Adrian I; at this time the church was called by the alternate name of the Basilica Eudoxiana, commemorating the woman whose munificence had allowed its rebuilding. In the mid-fifteenth century, the basilica was restored by the cardinal titular, Nicolo de Cusa. Later that century two cardinals from the della Rovere family (whose palace in Rome is the headquarters of the Order where I work) held the title: first Francesco and later Giuliano (later Popes Sixtus IV and Julius II, respectively) added to the complex of buildings on the site and ordered improvements on the church itself. This included the addition of the porch in front of the basilica, to which an upper story would be added a century later. 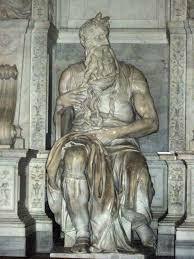 Although Julius II would be ultimately be buried in St. Peter’s, his incomplete tomb, including the famous Moses, (sometimes called the "horned Moses") was completed in the current state by Michelangelo in 1545. They call him the "horned Moses" because of a mistranslation of the Scriptures. When Moses would speak to God "face to face" in the meeting tent, when he emerged his face shone with rays. In the Hebrew it says "keren" - meaning either "radiated (with light) OR "grew horns." It seems that St. Jerome chose the wrong translation - but the statue of Moses has "horns" - just as the Latin Vulgate bible says. 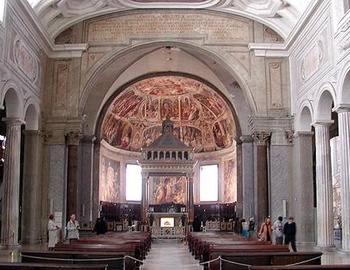 The church received additional interior decoration in 1577, when the frescoes of the apse were completed. In the first quarter of the eighteenth century a more complete renovation was undertaken, including a new ceiling. From 1876 to 1877, a sanctuary renovation created a confessio in front of a new high altar surmounted by a ciborium. 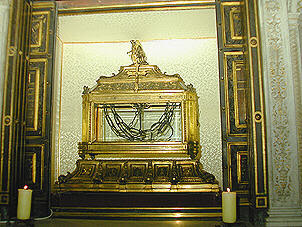 The chains of St. Peter, previously kept in a shrine in the left transept, were moved into the confessio for the veneration of the faithful. As I turn to leave (and head off to school) I turn and take one last look toward the confessio, where are kept the chains that bound on earth he who had been given the keys of heaven. St. Peter, Prince of the Apostles, Pray for us! As I read this, it reminded me of your very first homily as our pastor at St. Francis Xavier. You made such a compelling reference to it and I wish we had been able to see it on our pilgrimage last summer. 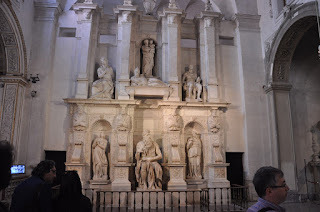 Thanks for being our eyes on this Roman Pilgrimage through the station churches. And if St. Jerome can get his translation wrong, I wouldn't feel too badly about getting the word for chains wrong. We do learn best from our mistakes.